A well-known Massachusetts contester and Yankee Clipper Contest Club member has gone on record urging fellow contesters to participate in the upcoming statewide Hurricane Drill on June 5. The Flea at MIT is sponsored by the Harvard Wirless Club, the MIT Electronics Research Society, the MIT UHF Repeater Association, and the MIT Radio Society. ….Eastern Massachusetts ARES stands down from support of the Northeast Massachusetts and Massachusetts Bay Red Cross Chapters from the Floods of May 2006…. After over a week of support for the NWS Taunton SKYWARN program and ARES activations for Masaschusetts Bay Red Cross damage assessment and distribution of care and clean up kits by the Northeast Massachusetts Red Cross chapter, ARES is standing down its operations as assistance is no longer required. Eastern Massachusetts ARES had been reactivated to support the Northeast Massachusetts Red Cross distribution of comfort and supply kits to people in Ipswich and Gloucester, Massachusetts and possibly other surrounding areas. At 10 AM Saturday, Dave Belsky-K1DBB requested ARES support for their operations of doing community outreach and distribution of comfort and clean-up kits to various cities and towns including Ipswich and Gloucester by contacting Eric Horwitz-KA1NCF and Jim Palmer-KB1KQW. This latest assistance occurring after working with Mass. Bay Red Cross and completing the damage assessment work in the Peabody, Danvers, North Reading, Salem, Saugus and surrounding areas of Central and Southern Essex County and Eastern Middlesex Counties. Coordinating Saturday’s efforts were Jim Palmer-KB1KQW, North Shore ARES Emergency Coordinator and Eric Horwitz-KA1NCF, North Shore ARES District Emergency Coordinator. Rob Macedo-KD1CY, Eastern Massachusetts ARES Section Emergency Coordinator also visited the base of operations which was at the Beverly office of the Northeast Massachusetts Red Cross chapter. Net Control at the town of Brigewater EOC, which serves as the Eastern Massachusetts ARES Command Center, was done by Carl Aveni-N1FY and Dan Howard-K1DYO. When Carl-N1FY left at 3 PM, Blake Haskell-K1BTH took over net control duties from his home location. In addition, KB1KQW-Jim Palmer, North Shore ARES Emergency Coordinator and KA1NCF-Eric Horwitz, North Shore ARES District Emergency Coordinator went to the Peabody office and assisted with coordination and planning for the potential weekend operations. Overseeing the operations and coordination with Massachusetts Bay Red Cross at the Peabody Office on Thursday were KA1NCF-Eric Horwitz, North Shore ARES District Emergency Coordinator, and KB1KQW-Jim Palmer, North Shore ARES Emergency Coordinator. Jim and Eric worked the phones and coordination with Red Cross and recruited Amateur Radio Operators. Net Control was done by Carl Aveni-N1FY from the town of Bridgewater EOC. All Damage Assessment operations were on the 145.47-Danvers Repeater PL: 136.5 Hz. Special thanks to the NSRA Club for their use of the repeater for ARES Damage Assessment and SKYWARN Operations during the Floods of 2006. Also, special thanks to WI1U-Charles Anderson for use of the 145.13-Gloucester Repeater on Saturday for outreach and distribution of supplies in the Gloucester area as the Gloucester Repeater has better coverage in that area. Thanks to all of you for your continued support of Eastern Massachusetts ARES!! 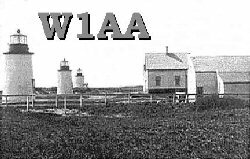 N1DT and K1VV plan to activate Three Sisters Lighthouses (ARLHS USA 975, 528 and 976) under the call W1AA on Saturday, May 20, 2006 from 11:30 UTC (7:30 AM EST) until 18:00 UTC (2:00 PM EST). “These should be new ones for a lot of the members. Middle was last activated in 2001 and Norh and South in 2003,” writes Robert “Whitey” Doherty, K1VV. W1AA will return to 40 meters phone about 1530 to 1600 UTC. Morse code operation will be conducted roughly on the half hour, on 7035, 10116, 14035 and 18080 kHz, plus or minus QRM. Bristol Co. RA Bringing Forth A “Gaggle” Of New Young Hams! Great news!! Between the Bristol County Repeater Association‘s last 3 VE sessions, we have passed a gaggle of new hams that are all kids! Last month a student from KB1CNA’s school passed his Tech exam […] keep an ear open for Sonny on the 145.15 machine. Last night we had two more students pass their Technician exams, one from KB1CNA’s and one from KB1CNB’s school, respectively. Tonight, four more kids passed their Technician! (Three from Kuss Middle School, and one from Morton Middle School.) That’s seven kids in a month, and even the oldest (by several years) barely has a learner’s permit to drive. All of the others are middle school age, and are plenty excited about ham radio. Let’s also not forget two brand new adult hams (Technician class) and a passed General written exam for a new ham who has only had his call sign a few days. Of the seven kids, six took part in the Kuss School program that the BCRA has been supporting for the last three years. So far, we have licensed 12 kids and three adults who have attended the program. How cool is that? It’s so cool that we still have several more kids at Kuss who are planning to take their exams soon. Stay tuned. Thanks to W2DAN and WA1ESO who came most weeks to help with the classes at Kuss, and especially to the BCRA VE team for conducting two test sessions on consecutive evenings. So, please keep an ear open for a bunch of new operators, and please welcome them to the hobby in the best ways we know how. Surely we’ll hear a few new voices on the 6 PM youth gathering on the ‘515 repeater. The April, 2006 EMA traffic net and Public Service Honor Roll totals have been posted to http://nts.ema.arrl.org under “Main Menu | STM Monthly Report“. At the request of Massachusetts Bay Red Cross, Eastern Massachusetts ARES will activate starting Thursday Morning for damage assessment operations in the North Shore. This operation could last several days and more volunteers maybe needed from across the section. Eastern MA amateur and ARRL Volunteer Counsel Fred Hopengarten, K1VR will present at a Dayton Hamvention forum entitled “Amateur Radio and the Law: Getting It Up and Keeping It Up” on May 19. 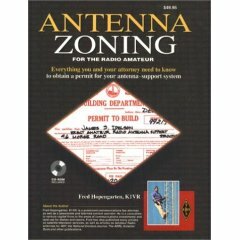 Hopengarten, who is the author of “Antenna zoning for the radio amateur” will present along with other prominent amateurs in the legal field on issues involving restrictive covenants, preparation for tower permits, as well as information on the latest court rulings on RFI, PRB-1 and towers. The panel will also discuss the latest news on the ARRL’s Amateur Radio Legal Defense and Assistance Committee. Other panel participants include: Jim O’Connell W9WU, ARRL Volunteer Counsel (Moderator), Chris Imlay, W3KD, ARRL General Counsel, Jay Bellows, K0QB, ARRL Dakota Division Director and Volunteer Counsel Tim Ellam, VE6SH, IARU Vice President Brennan T. Price, N4QX, and ARRL Volunteer Counsel John Siepmann, N9NA. At the request of Massachusetts Bay Red Cross, Eastern Massachusetts ARES will activate starting Thursday Morning for damage assessment operations in the North Shore. This operation could last several days and more volunteers maybe needed from across the section. There may also be a need to support Damage Assessment operations for the Greater Newburyport chapter of Red Cross as well per Dave Belsky-K1DBB, Greater Newburyport Red Cross Communications Officer. 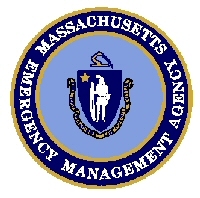 At 630 PM Wednesday Evening, Tom Kinahan-N1CPE, Massachusetts State RACES Radio Officer received a call from the EOC liaison to Mass. Bay Red Cross with a request for several Amateurs to support communications for damage assesment. This request was passed on to me and given to North Shore ARES District Emergency Coordinator, Eric Horwitz-KA1NCF and North Shore ARES Emergency Coordinator, Jim Palmer-KB1KQW. North Shore ARES will be deploying approximately 4-5 Amateurs with the damage assesment teams and they will meet at the Peabody office of Mass. Bay Red Cross. The Eastern Massachusetts ARES Net Control Center at the town of Bridgwater EOC will be utilized to act as net control. 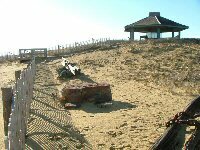 Operations will take place on the 145.47-Danvers Repeater, PL: 136.5 Hz. Remember, do NOT self-deploy. Please get approval instructions From Eric-KA1NCF, Jim-KB1KQW or I for involvement in these operations. Thank you for your continued support of operations for Eastern Massachusetts ARES in the wake of the Great Floods of 2006. The request has been canceled. They have shut down the EOC operation from it’s response mode to a recovery effort and no longer needed the same level of staffing. This is the list of all radio operators who assisted at Region 1 during this event. I hope I did not miss anyone! Once again, thank you all again for your generous support during this event! Thanks for your support in the Floods of 2006 in Northeast Massachusetts! The ARRL Headquarters web site today carried a news item describing the efforts of New England and Eastern MA amateurs in the wake of disasterous flooding that has struck our area. In the article, Eastern MA Section Emergency Coordinator Rob Macedo, KD1CY estimates that “more than 100 radio amateurs have been involved in the operation and spotting work across the region.” He also describes the volunteer activity in staffing the NWS office in Taunton and in the Massachusetts Emergency Management Agency State EOC and Region I Headquarters. BPL: Your Help Is Urgently Needed! We need your help in our ongoing fight against Broadband over Power Line (BPL) interference. As you may have heard, the ARRL was successful in obtaining language in a U.S. House of Representatives bill, HR 5252, requiring that the FCC study and report on the interference potential of BPL systems. The bill was adopted by the House Commerce Committee and will be on its way to the House floor for a vote shortly. Now we must turn our attention to the Senate, where similar language is needed. Senator John Kerry is a member of the Senate Committee on Commerce, Science, and Transportation, which is now holding hearings on telecommunications legislation. We need Senator Kerry’s support of language addressing the BPL interference issue when the Senate bill is marked up in his committee on June 8. Thank you for your assistance and support. If you want to email me in reply to this message, please use the email address shown below. A similar requirement that the FCC study and report on the interference potential of BPL systems is included in HR 5252 as reported out of the House Committee on Energy and Commerce. 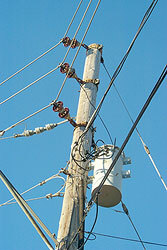 BPL utilizes electric power lines to serve as the conductors of the broadband signals. Unfortunately, because the power lines are not shielded, they also act as antennas and radiate the signals into the air. These radiated signals will interfere with radio receivers tuned to the same frequency range. BPL has only been deployed to a very limited extent, but Amateur Radio already is experiencing severe BPL interference that the FCC has been unable or unwilling to correct. Unlike BPL, other methods of providing broadband Internet services to consumers, such as cable, DSL, wireless, satellite and Fiber to the Home, do not pollute the radio spectrum. Not all BPL systems cause widespread interference to radio. The problem is that the FCC rules do not distinguish between BPL systems with a high potential for interference and those that are more benign. The FCC allows both kinds of systems to be deployed. This places an unreasonable burden on radio users, who must deal with the consequences of the interference. It is also unfair to the responsible BPL companies that have addressed the interference issue effectively but must compete with the spectrum polluters. The reason we need your help is that the FCC continues to resist growing evidence that its rules are inadequate to protect radiocommunication systems, including those relied upon by First Responders, from radio spectrum pollution caused by BPL systems. The FCC needs to objectively and carefully review this evidence and adopt rules that will keep interference from BPL within reasonable bounds. Unfortunately, not only has the FCC shown no inclination to do that, the agency so far has failed even to enforce its existing rules in specific, well documented instances of harmful interference. Because we need no infrastructure in order to communicate, the Amateur Radio Service is the only 100-percent fail-safe emergency communications resource in the world. The importance of this capability is documented on page 177 of the recent report of the Select Bipartisan Committee of the House of Representatives, “A Failure of Initiative,” on Hurricane Katrina. Amateur Radio is included in the list of “What Went Right” in the White House report, “The Federal Response to Katrina: Lessons Learned.” Amateur Radio is one of the few communications services that succeeded in Katrina’s aftermath. Interference from BPL emissions will significantly disrupt this unique capability. Please require the FCC to protect radio services from BPL interference. Thousands of radio amateurs will be grateful for your support. “We extremely fortunate to again this year have the services of Bill, NIVUX, as our FD editor. Bill’s fantastic pages are available on our section web pages http://ema.arrl.org/fd, so please check it regularly! As before, the pages offer pertinent information on location, times, and other FD site information. However, his presentation is only as good as that provided by our clubs, so please check them now and offer corrections directly to Bill. He will leave a link directly to his email address for your convenience. Bill also has a wealth of reference pages for your perusal to help with your FD preparations. W1OH “QRP To The Field” Operation At Marconi CC QTH! Geoffrey Allsup, W1OH presents an excellent web article highlighting his recent QRP To The Field operation from the former Marconi “CC” station QTH on Cape Cod April 29, 2006. This year’s theme for QRPTTF was “Park It Here” which encouraged operation from parks. W1OH reports a “very successful day” with 22 QSOs and several trans-Atlantic contacts. Perhaps more importantly, Allsup interacted with numerous visitors: “a dozen groups, ranging from one or two folks, up to about a half-dozen at a time” affording Allsup the opportunity to hand out Amateur Radio literature. 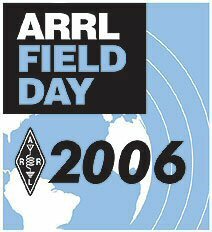 The Southeastern MA Amateur Radio Association plans to operate in the FISTS Spring Sprint from 1700Z to 2100Z May 13, 2006. “You do not need to be expert in CW, any speed is fine. Come and enjoy the company of fellow hams while having fun making contacts,” writes Ron Silvia, WB1HGA. Silvia and company will be ready with two stations for the event. “We should score much better this time around,” Silvia notes. SEMARA has operated in previous FISTS on-air events, logging contacts across the US and Canada.